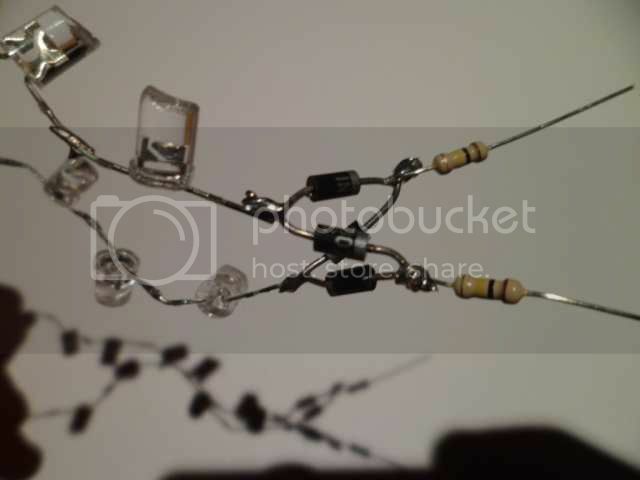 Make a simple mains powered decorative LED lamp. This is a really neat project that lets you make a rather attractive mains powered lamp that has a string of LEDs inside it. It's not intended to illuminate a room, but is just for decorative use, although it does make a very nice night-light. This project does involve mains voltage, so should only be tackled if you are confident in your abilities to make it safely and robustly. This is what we're aiming for. How attractive is that! You can use any colour combination and lens style of LED you like to make up a custom lamp. The power consumption is about a quarter of a watt so it can be left on 24/7 without worrying about the running cost as it will literally be pennies a year. And here's the super-simple circuitry. Just a couple of common quarter watt resistors and a bridge rectifier which can be cobbled together from four normal 1A diodes like 1N4007's. The choice of resistor will depend on your mains supply. 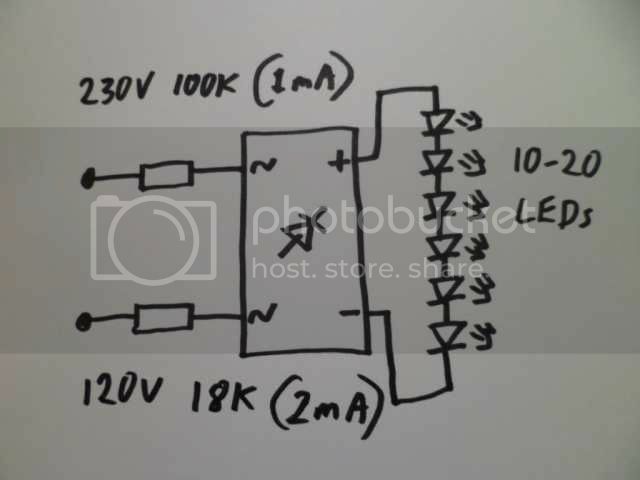 For countries with a 220 to 250V supply I would suggest two 100K (100 thousand ohm) resistors, while for countries with a 100 to 130V supply I'd suggest two 18K (18 thousand ohm) resistors. The circuit can run from just one LED up to 20 or more depending on your supply voltage. I'd recommend somewhere between 10 and 20 LEDs in series though, or up to 40 if your supply voltage is around 230V. 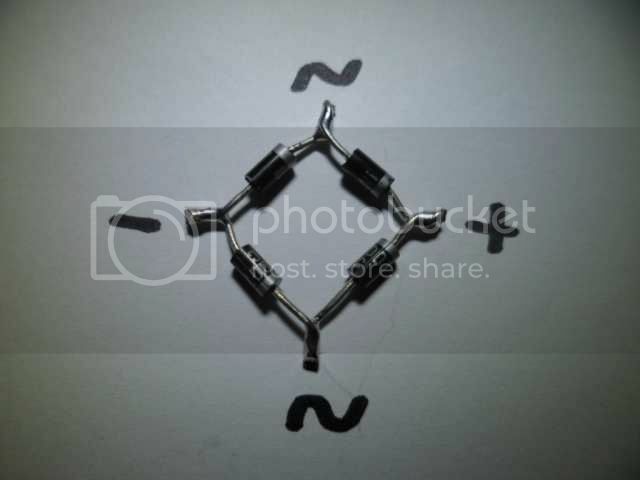 To make the rectifier start by getting four diodes and joining two by twisting the ends with the stripes together, then join the other two by twisting the end without the stripes together and solder as shown above. 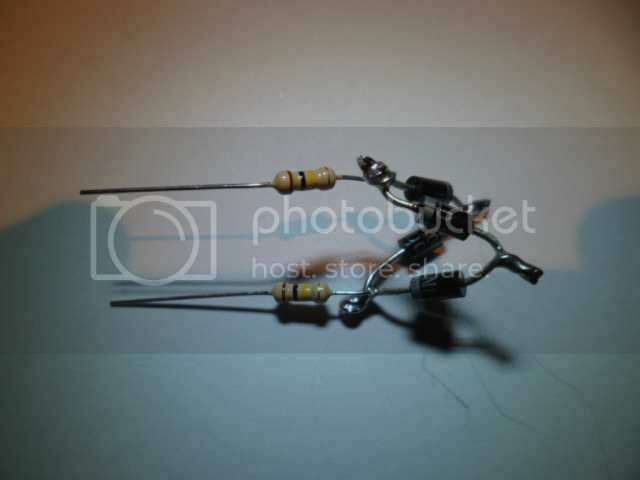 Now join and solder the two pairs as shown to create the bridge rectifier. The polarity will be as shown above with the two AC connections indicated by squiggles and the positive (+) and negative (-) connections that will connect to the string of LEDs. It's useful to note that the stripes on the diodes all point away from the negative terminal and towards the positive terminal. Solder your two resistors to the AC connections of the bridge and fold it slightly to make it easier to get into your chosen cover if required. 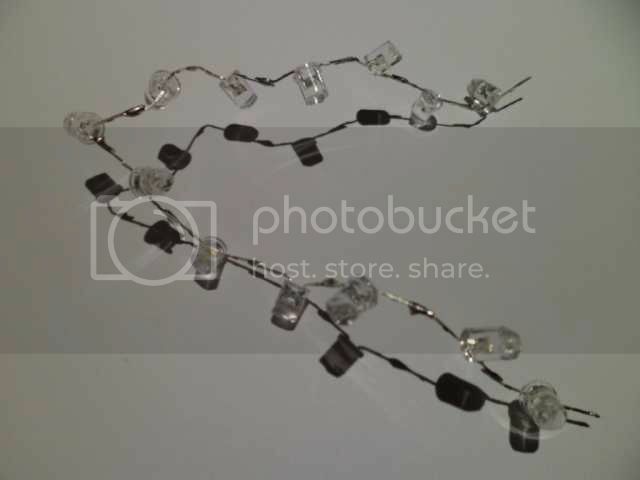 Now we make our string of LEDs. In the picture above I used a selection of warm and cold white LEDs with a few coloured ones thrown in. I've also "cracked the ice" of the LEDs (snipped the end of the lens off) to make their light output less directional. 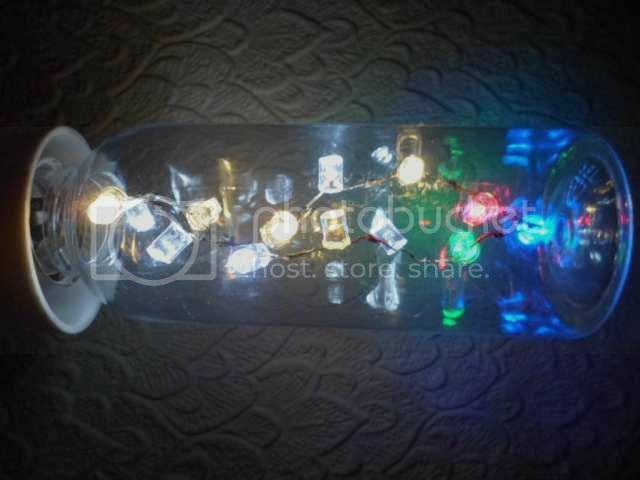 The LEDs are all wired in series with each ones anode (+ve) going to the next ones cathode (-ve). You can use up to 20 LEDs on a 120V supply or up to 40 on a 230V supply. 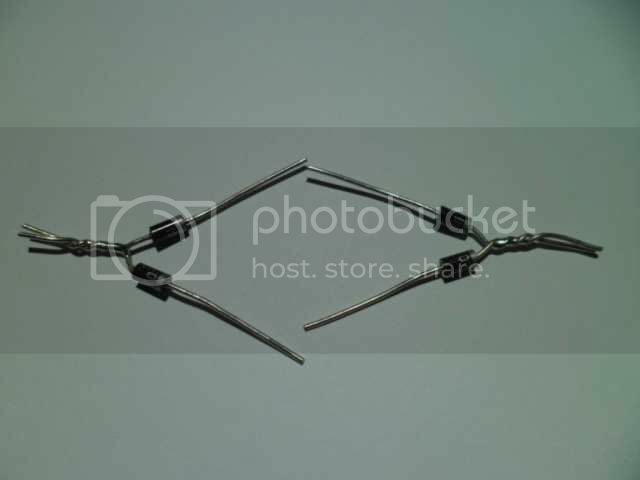 The string of LEDs is connected with its positive end going to the positive (+) of the rectifier and the negative end going to the negative (-) of the rectifier. 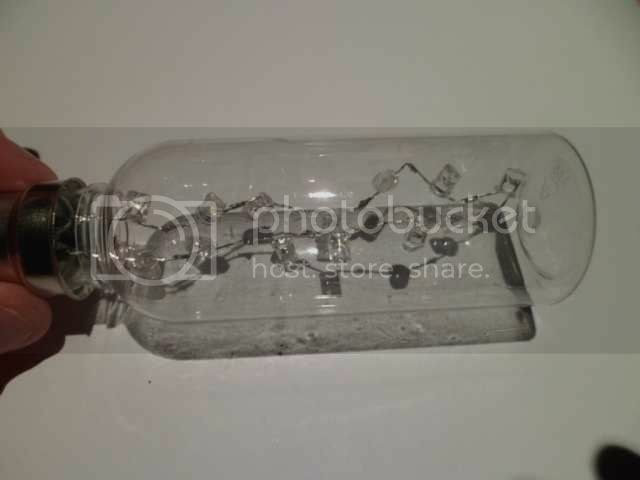 After several unsuccessful attempts to carefully break open glass lamps at the base which resulted in heavy bleeding I suddenly realised that I could use the scavenged base from a compact fluorescent lamp with a suitably sized plastic or glass bottle. 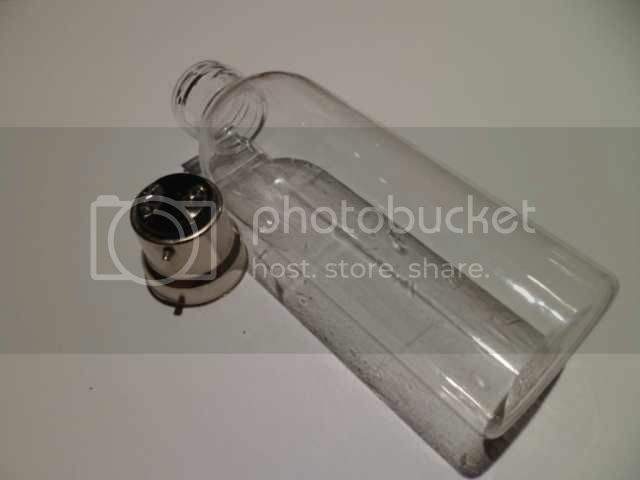 In this case I'm using a bayonet cap base (which is the most common in the UK) and a plastic bottle got as part of a dollar-store travelling set. 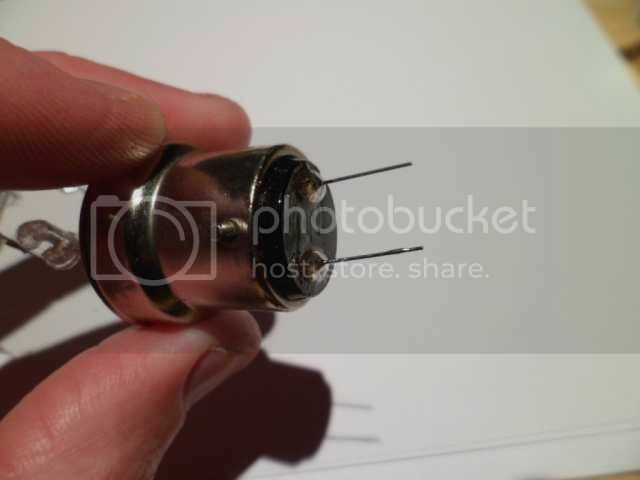 The two resistor leads are carefully soldered into your chosen lamp-base, making sure that nothing can short against the side. The circuitry does not get hot, so it can be insulated from the side with glue and the cover can also be secured on with glue too after it's been tested. Now the LEDs get gently arranged and shoved into the chosen cover. Don't worry about the LEDs shorting against each other as the power supply will handle a dead short safely, but any that do short against each other may not light until separated again. Then with due safety precautions give your lamp a test, and if it works and you like the colour combination then you can glue it in place securely. And that's it. you've made a custom low-energy decorative lamp.